The jury is still out as to whether Amazon’s Kindle Fire- at less than half the price and lacking some major Apple restrictions- is exactly an iPad killer just yet. “We are lowering our unit shipment estimates for iPad in the [December] quarter from 16 million to 13 million. Based on data from Amazon, we believe the Amazon Fire likely sold 4 [million to] 5 million units this holiday season,” wrote Tavis McCourt, a Morgan Keegan analyst. As a result, the Kindle Fire took away “maybe 1 [million to] 2 million” iPad sales, McCourt said. It appears Q4 was good for Amazon, and the retailer- always a bit coy with solid sales figures- reports more than a million Kindle Fires shipped each week of December in 2007. 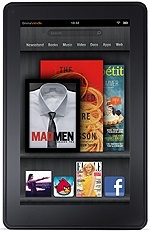 Did you pick up a Kindle Fire in 2011?